If you are looking for tools that will push you ahead of others, then you are better placed working with specialized tools. Ditch the kitchen knife and spoon and get yourself some decent tools. After all, it is not a dessert you are having. 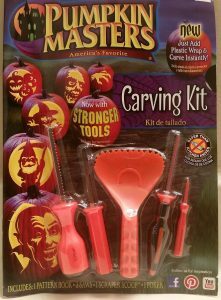 Getting yourself the Pumpkin Masters carving tools is probably one of the best decisions you can make if Halloween is a season you don’t want passing you by. The kit is only cheap, but they are the coolest when making those precisely detailed carvings. They are easy to use. This professional pumpkin carving tools kit includes an easy-to-follow step especially if you are a beginner. There is a small guide showing what to do and which tool to use where. Not much tools kit go this far as much as providing a good guide is concerned. The price is on the lower side meaning that it will not be much of a strain for you when it comes to finances. This subject is sensitive to you especially if you are a beginner. Furthermore, looking to save an extra buck is not such a bad thing. With these tools, making precise and accurate cuts is as easy as it sounds. They are designed to specifically do just that, and so you have a gem on your hands. Includes templates that easily stick on the gourd. This is actually a good thing since much of the time in pumpkin carving is spent poking holes in the pattern. This is tedious and boring. The kit looks and feels like a toy. The plastic parts are flimsy and can easily break or crack when applying considerable pressure on the tools. The blades are not adequately sturdy, and so the easily break. This, not something that a beginner wants to hear. This pumpkin carving kit is best suited for the children and beginners. Experienced carvers can do with better tools. They are just too flimsy for extensive and detailed carving. If you have already purchased this best pumpkin carving kit, be careful with the blade. Treat it as you would a razor blade, and everything will be okay. There is no need to abandon your carving on account of poor quality blades. You can still get the best out of the equipment. Pumpkin carving tools are sharp regardless of the quality of the products. It does not matter whether your child is 5th grade or 9th grade. They all need adequate supervision. Don’t assume that they are all good on their own and the tools they are using are relatively safe. That one moment you leave them alone is when they accidentally cut themselves. Give them the necessary supervision and individual instances where they cut themselves will be a thing of the past. Sharp tools are in most cases the ideal. However, they can cause some serious injuries is especially when they get stuck in the thick part of the pumpkin. Keep the sharp tools away from the children and let them only handle the seeds and fibers. Scooping the innards can never be that dangerous for them. Support can be many forms when purchasing products. Some manufacturers take the extra step and offer more than just the product. Some carving kits come with sharpening tool. Others have additional tools to make your work easier and others may include a manual. While the quality of the primary product should always be the first thing to consider, having this additional support is always prudent. Don’t pass by it without giving it much thought. This extra offer may be what you need to carve your eye-catching masterpiece. The reputation of the organization matters significantly when purchasing a product. There are some firms out there recognized for their effort towards quality. In most cases, these companies are more than likely to replicate the same quality. Therefore, you can get a quality product by just picking is a reputable organization. Beginners can start off with some simple tools through which they can grow. Even though pumpkin masters have a number of flaws that include blade breaking, they offer a great starting point for novices. Children will also benefit from this kit.